Woo. I'm going to join when I get home. I think after christmas is a good idea. It means we can throw some ideas around and everyone will be busy around this time any way. p.s. please invite friends who maybe interested. I can't find the group help!! Neither can I. I searched Edinburgh craftsters. If anyone is interested in coming I believe it's 7:30 PM every Tuesday, in the back room. Hi, I'm sorry for posting in a old thread, I couldn't find in the rules if there is a cut off date for old threads (if there is I'm sorry for posting here) - all the other forums I am on have one. I am based in Leith and am teaching myself to crochet (about 3 weeks in), I'm doing ok at the moment on the basic stitches. 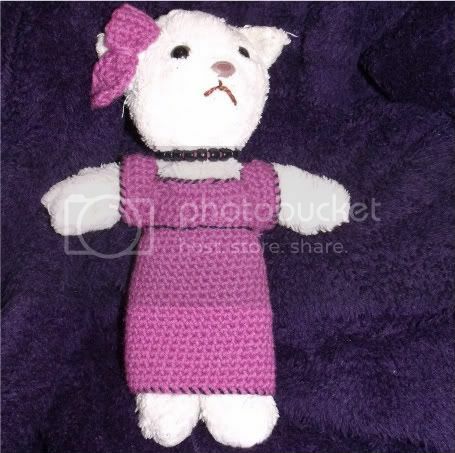 My current profile picture is of my first teddy in a dress which I made myself in a evening. I would like to find a group in Edinburgh, but I can't do Tuesdays - I fence then. Only girls fight with swords these days! I'm not sure if your group ever got together but I'm responding as I and a friend are soon going to be visiting Edinburgh for a week in June. I hope to find fabric and yarn stores and would appreciate any help in identifying such. Can you, or any of your friends be of help? Thanks in advance. Hope you are having fun planning your holiday! Edinburgh is a beautiful city, I'm sure you will have a great time.